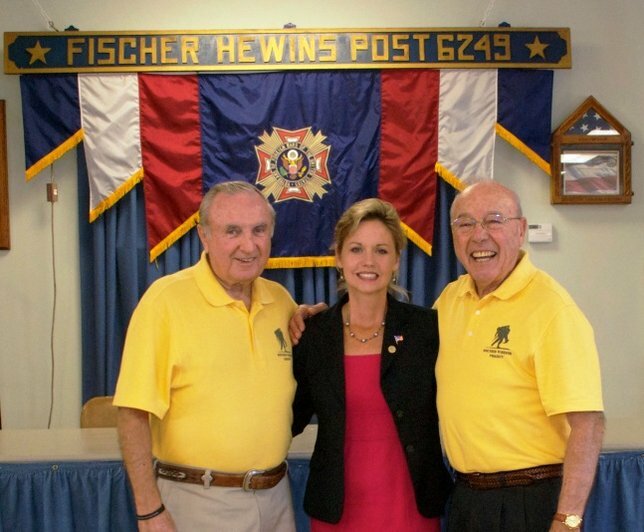 On Tuesday, October 15th, Legislator Sarah Anker joined theRocky Point VFW in hosting a Veterans Appreciation Breakfast. Rocky Point, NY - October 17th, 2013 - On Tuesday, October 15th, Legislator Sarah Anker joined the Rocky Point VFW in hosting a Veterans Appreciation Breakfast. The event took place at the Rocky Point VFW Fischer-Hewins Post 6249, where members of the post and local American Legion groups gathered for a hot meal,provided by Mount Sinai’s Bagels Your Way, and information about programs offered by the Suffolk County Veterans Services. Legislator Anker presented awards to the Rocky Point VFW Post 6249 for its contributions to the community, and Frank Dapolito and Bob Wedderburn, President and Vice President of Birchwood Veterans Group for their work with the Wounded Warrior Project.For more information the programs available to veterans, please call Suffolk County Veterans Services 631-852-1410. Pictured: Bob Wedderburn, Vice President of Birchwood Veterans, Legislator Anker, and Frank Dapolito, President of Birchwood Veterans. Subject: LongIsland.com - Your Name sent you Article details of "Legislator Anker: Thanking Our Veterans"